Brazil endured their first set of back-to-back losses on home soil since 1940, losing the third place game at their World Cup to the Netherlands 3-0 in Brasilia on Saturday night. The result concluded what local media have called an "$11 billion nightmare" for the hosts, and while that seems cruel considering the great entertainment we have seen here this summer, there is no mistaking the depth of Brazil’s humiliation. What had been such a promising World Cup on the field for the hosts became a disaster last week, when Germany delivered a beat-down of epic and historic proportions. Brazil coughed up seven goals in that match, and after Saturday, their grand total for this World Cup stood at 14, the most they had ever allowed in a World Cup tournament, and for that matter, the most any host has ever conceded their guests. How did they hit such heights? Easy. Brazil’s frantic play paired with dreadful defending allowed them to throw games away right from the opening moments. Brazil conceded a goal from the penalty spot in just the third minute. They never recovered, and the one-time golden boys would depart with boos ringing in their ears. Arjen Robben raced into the area two minutes into the game on a clean breakaway. Thiago Silva reached out, grabbed him by the shoulder, and hauled him down, and referee Djamel Haimoudi immediately pointed to the spot. While it was questionable if the foul was actually inside the box or not, everyone was baffled that Thiago Silva subsequently remained on the field. It was a clear red card offense. Even if this third-place match is a wretched and unloved one, it still felt like the wrong call, and it would signal a shaky evening from the man in the middle. Even so, Robin van Persie stepped up to the spot, and pinged the shot home with authority. Fourteen minutes later, the Dutch ran a textbook counterattack, overloading the right side with Jonathan de Guzman cutting the ball back from the far side. David Luiz bafflingly headed the ball out into space, and Daley Blind stepped up, and on his weaker foot, barreled it home. 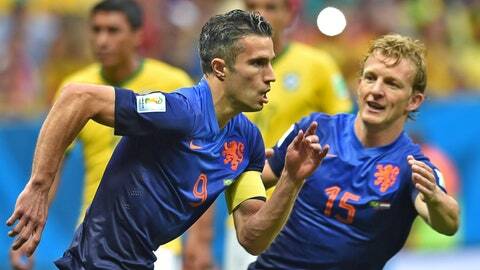 Blind is not exactly a goal-machine — his last strike was back in February and this was his first for Holland, ever. Georginio Wijnaldum added a late insult, sweeping in a shot served in by Daryl Jamaat. It was pathetically "defended" by Julio Cesar, and when it went in, the catcalls from the Mane Garrincha grew ever louder. Those boos stung. David Luiz has worn the hangdog expression of a jilted lover throughout these past two matches. Once the face of this team, he has become the scapegoat. The tears he has shed over the week are genuine, but he has imploded so spectacularly at this World Cup, with boneheaded plays following bad fouls. Somewhere, surely, Roman Abramovich was rubbing his hands with glee — Chelsea sold David Luiz to PSG for some $80 million on the eve of this World Cup (On the other hand, Laurent Blanc, who now faces a future with Maxwell, Thiago Silva and David Luiz on his back line, may be checking his pockets to see if he still has the receipt). The only person in yellow who looked like wanted to be on the field was Oscar, and after a largely invisible performance against Germany, he was a consistent threat for the hosts. But despite winning a number of free kicks for the hosts, their best chance didn’t come until the hour mark, when Ramires dragged a shot wide of Jasper Cillessen’s goal. Oscar was in fact booked for diving in the 69th minute — a terrible call that wrapped up a mystifying performance from Haimoudi, who seemed to be watching some other game, at some other stadium. 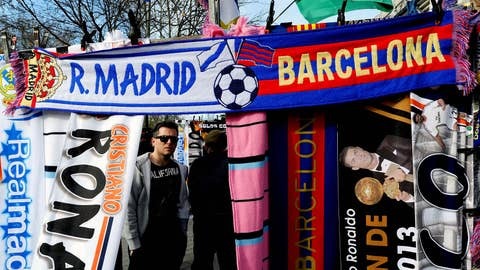 Narrowing down the list of the best El Clasicos which brought wonders to the footballing world. For the Dutch, this was a case of simply going through the motions. It felt as if another box was checked off for the World Cup’s perennial bridesmaids — they had never won the bronze at the World Cup — but their manager, Louis van Gaal, had made no secret of the fact that he thinks these games are useless wastes of men’s time. He’s got a point, and only Robben really looked as if he was giving his all. Brazil can take heart that many of the worst fears around this World Cup — the protests that roiled the Confederations Cup, the high-wire rush to finish the stadiums, the real worries over security — did not materialize. But the nation will still feel burned. Brazil spent an incredible sum on a World Cup with few tangible lasting benefits — and worst of all, they didn’t win it. The vitriol that has been directed at FIFA, at Sepp Blatter, and at their president, Dilma Rousseff, is a reflection of that anger, and it will be interesting to see what happens next. Off the field, Rousseff is likely to lose her October election, and FIFA have come out of this World Cup looking even more roguish than thought possible (the capper may be the farce that is the growing ticket-reselling scandal which saw a high-ranking FIFA associate named a fugitive by the police). On the field, if Brazil can rebuild their domestic leagues and development program, getting back to the style that carried them to many triumphs, they may yet be a team of the future. Right now, however, they are fourth. And in this football-mad country, that cuts deeply indeed. Brazil: Julio Cesar; Maicon, David Luiz, Thiago Silva, Maxwell; Luiz Gustavo (Fernandinho, 46), Paulinho (Hernanes, 57), Ramires (Hulk, 73), Willian, Oscar; Jo. Netherlands: Jasper Cillessen (Michel Vorm, 90); Dirk Kuyt, Ron Vlaar, Stefan de Vrij, Bruno Martins Indi, Jordy Clasie (Joel Veltman, 90), Daley Blind (Daryl Janmaat, 70); Georginio Wijnaldum, Jonathan de Guzman; Arjen Robben, Robin van Persie.